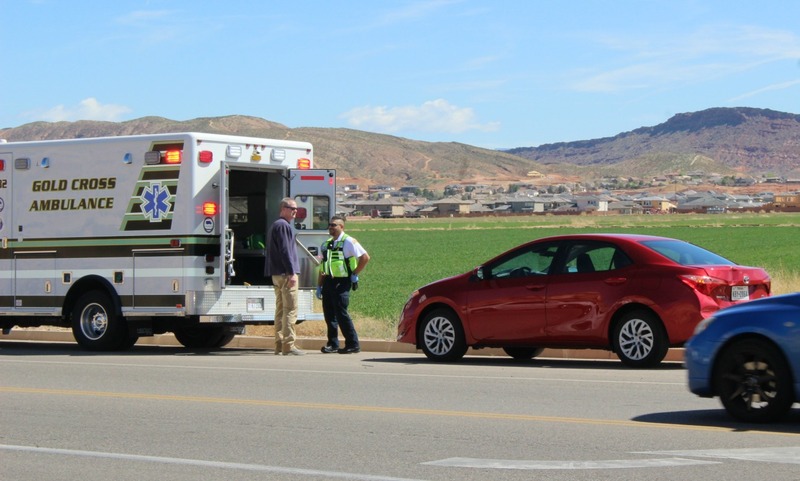 ST. GEORGE — A passenger was transported to the hospital after a two-vehicle collision Wednesday. Officers and emergency medical personnel responded to the corner of South 3000 East and East 1580 South for the crash involving a red Toyota Corolla and a white pickup truck. Paramedics found one injured passenger in the Corolla who was transported by ambulance to Dixie Regional Medial Center to be treated for injuries, St. George Police officer Ken Childs said. “The passenger suffered minor injuries; possibly whiplash,” he said. After speaking with witnesses, the officer determined that the Corolla was stopped at the stop sign facing west on 1580 South waiting to make a right turn to head north on 3000 East. The pickup truck was stopped directly behind the Corolla as the driver also waited to make the turn to continue on 3000 East in the same direction. The Corolla began to pull past the stop sign once cross traffic appeared to clear, but the driver stopped to get a clearer view of traffic coming from the south and was struck from the rear by the pickup truck. The man in the pickup truck told the officer that once he saw the Corolla pull past the stop sign, he looked to the left checking for cross traffic as he continued moving forward, thinking the Corolla already pulled onto the roadway. The truck sustained no visible damage, while the rear bumper of the Corolla was damaged. The man driving the pickup was later cited for following too close.